This time at 'TBs Week TechVideo', let me show some videos for a Precession Drive mechanism. They are a creation from Parax (Mike Hatton), who raised them to my attention. It's all about a 10:1 reduction system with tick action (like the Geneva Mechanism), but the whole system uses just one cog. A very compact and ingenious design, indeed! According to the author's explanation, it works like a spirograph. The mechanism depends on the chain not turning, hence it is blocked somehow. The chain is bigger than the central cog, so as the chain is dragged around, the cog is forced to precess backwards. Mechanism works by dragging excess chain around the cog, 2 links at a time (2 links = 4 bars on 40 teeth cog = 10:1 ratio). It uses 22 links of chain (21 chain + 1 tread) on a 40 tooth gear. There is also another video (with narration and my favorite), but it is a preliminary version where chain links are tied by a thread (cotton string) . Mechanism was a bit slack, however still a great design! 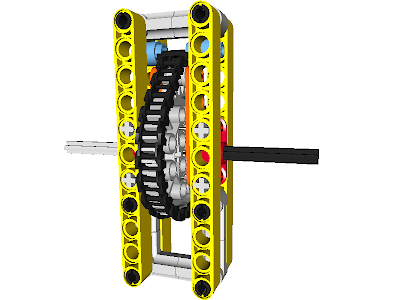 According to Parax, the final and full LEGO version was achieved with the help from Philo, who suggested him to use one wide tread link to prevent the chain from moving around . After adding 1x1 round bricks on each side of it and slotting them between beams, it was ready for the thread loops removal. Look into Parax Chain Precession Drive Brickshelf folder , to see more details and better understand the mechanism working principles. Find also the corresponding LDraw file here, with the model below. According the author, he developed also some other ratios with good results. He has 6:1 and 12:1 reduction mechanisms in the pipeline, so he may return one of these days with a full working clock, based on these constructions. Or at least a 60 second counter, by combining 6:1 and 10:1 mechanisms. Edit: Since I already had this post in draft for a few days, Parax meanwhile came out with two videos for his 60sec counter, which I didn't notice when posted. So, I decided to edit the post to include them also. It is an accelerated version for a minute/seconds counter and includes four mechanisms (two 1:10 and two 6:1). Minutes on the red side (left) and seconds on the green side (right). Now he just needs to calibrate (program) the NXT motor to rev once per second. I was enthusiastic when Parax first showed me his mechanism - and remains so! It uses both a 10:1 Ratio and a 6:1 Ratio also. I've just built the device according to the instructions in Parax's Brickshelf folder, and I'm still not entirely sure how it works. However, I do know that it's the most beautiful thing I've seen in Lego for some time. It's simple, elegant and, well, just damn clever. Very well done indeed! A so simple mechanism with a so fantastic working. This is the kind of things that makes me proud to be a LEGO fan, not to mention a TECHNIC fan. This is wonderful! Congrats to Parax for his ingenious solution for an odometer! I actually took a bit to really understand it. I'm really amazed with it! The comments made me go back to this topic. Thanks Conchas for another great issue discussed here. And obviously to Parax sharing his creation with us!